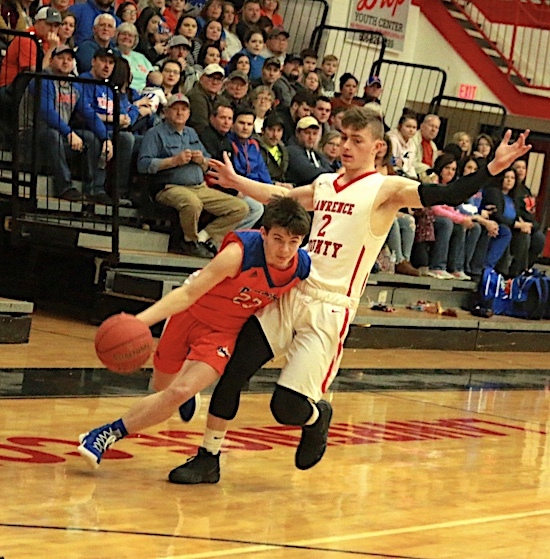 LOUISA, KY. — Lawrence Co. ( 16-6 ) held Tolsia ( 10-4 ) to one three pointer in a 71-52 victory Saturday evening in the Believe Border Battle at Lawrence Co. High school. Rob Cantrell of Tolsia goes up for a shot as Bulldog Senior Noah Fairchild closes in. The Dawgs swept the season series with the Rebels. 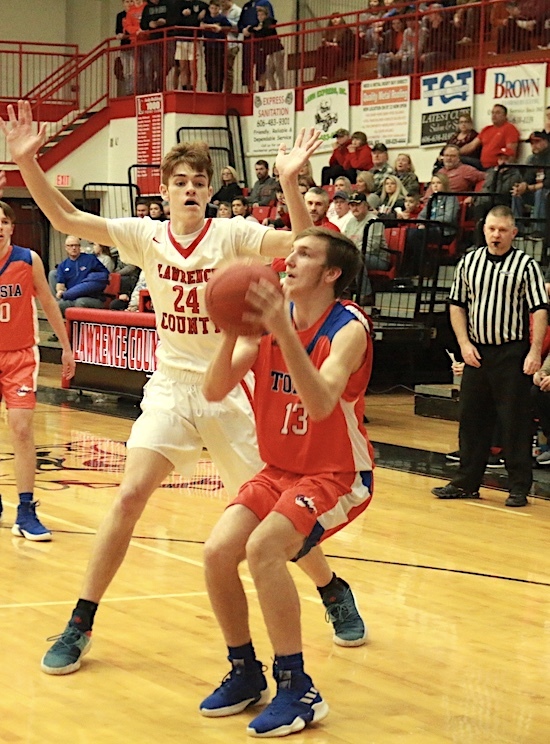 Lawrence Co. led 16-8 after one period and 42-19 at Halftime behind a smothering defense that held the Rebels to their lowest first half point total of the year. In the second half Tolsia made a little run in the third period out scoring the Bulldogs 20-13 but could not get any closer. Cody Maynard tries to navigate through the Tolsia defense Saturday night. Tyler Maynard poured in 25 points to lead a trio of Dawgs in double figures, Cody Maynard tallied 14 points, Noah Fairchild 11 points and 12 rebounds, Chase Sartin chipped in with 8 points, Alex Ratliff 5 points, CJ Fairchild 4 points, Trenton Adkins 3 points.LCHS hit 6 three pointers and went 17-23 from the free throw line. Tyler Maynard applies tough defense on Jesse Muncy in the Believe Border Battle. 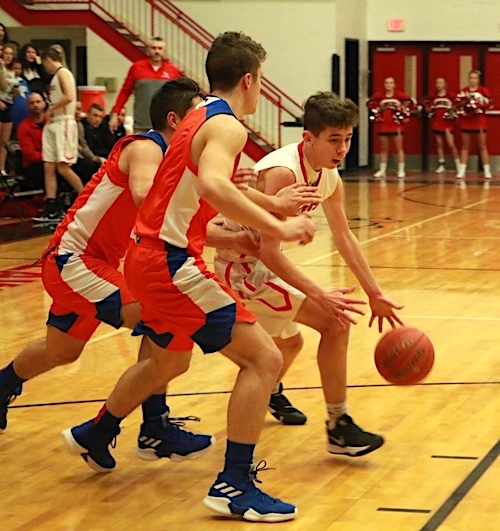 Tolsia was led by Austin Salmons with 13 points and 10 rebounds, Rob Cantrell tallied 10 points, Jacob Mollette and Jesse Muncy were held below their season averages with 9 points each, Zane Sturgill 5 points, Blake Sturgell and Zack Ball 2 points each. THS hit 1 three pointer and went 15-17 from the charity stripe. Lawrence Co. will travel to Russell and Tolsia will travel to rival Tug Valley both games tonight. The Bulldogs took a huge step toward the #1 seed with a home victory over the Blackcats. The Dawgs are now 4-1 in 58th District play with 1 game remaining. Cody Maynard hit 6 three pointers and went 8-8 from the free throw line to finish with 28 points to lead the Dawgs. Tyler Maynard netted 20 points, CJ Fairchild tallied 8 points, Chase Sartin 4 points and Alex Ratliff 3 points. LCHS hit 9 three pointers and went 16-23 from the line.